what a beautiful light by dutch designer jo meesters. it looks more like a substantial credenza or other piece of furniture from the way it is crafted. 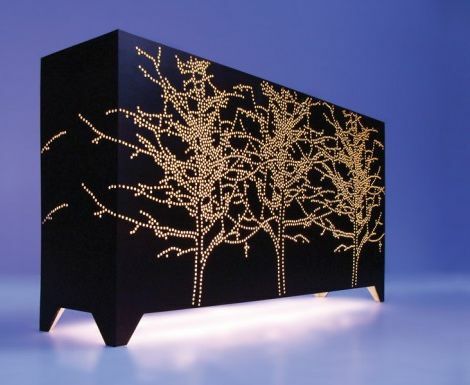 made of wood, 8,000 holes have been carefully drilled and plugged with resin so that when lit from within, the pattern resembles low growing trees. what a gorgeous, glowing room divider this would make, on or off. see more from jo on his website. oh man. that is cool! need to see it live.